If you use the internet to market your business, you’ve likely heard the term “inbound marketing” a lot in the last few years. Entire books have been written about inbound marketing, such as this one and this one. But this is a crash-course, so we’ll keep it quick and dirty for you now. First things first: what, exactly, is inbound marketing? And how does it help you drive more traffic to your website and bolster your lead generation efforts? As an inbound marketing agency, we have this conversation a lot. Inbound marketing is the opposite of traditional marketing–what is now known as “outbound marketing.” Before search engines like Google forever changed the way consumers found information, companies relied on interruptive techniques like telemarketing, direct-mail, print advertising, TV or radio commercials and trade shows to get their message across. That’s outbound marketing. Inbound marketing is different. Rather than chasing down potential customers with traditional outbound techniques, inbound marketing is about getting those leads to come to you. It’s knowing what your customers want, and publishing the right content at the right times to answer their questions, while guiding them through the sales funnel. But how can we accomplish that? There are a few major components to a fully-realized inbound marketing strategy. 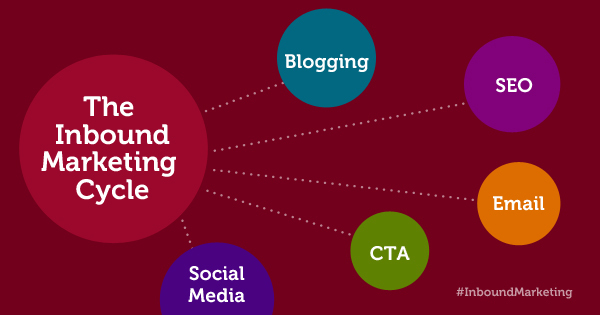 Blogging is at the heart of any sound inbound marketing campaign. A blog is the simplest and most cost-effective way to attract visitors to your website. But you can’t just blog about anything. To keep customers coming back, your blog must be highly targeted, educational and entertaining. Every post should have a specific buyer persona in mind, and each should focus on a keyword that’s highly relevant to your business. Finally, every blog post you share should include some call-to-action (see below). Sharing your content on social media platforms like Facebook, Twitter, LinkedIn and Instagram is the easiest way to get your message in front of your potential customers. Social media marketing lets you engage with your audience, rather than simply talking at them—putting a human face to your business while finding out what’s really important to your customers. It’s also the only way to ensure your content gets shared. To make it really easy, be sure to build social sharing buttons right into the template of your blog. Create really great content, and you might even go viral! SEO for inbound marketers isn’t about buying links or manipulating search results. It’s about following the guidelines set forth by Google and other search engines to ensure that both your blog content and your website content have the best chance of being found online. SEO best practices include optimizing your page titles, meta description tags, URLs, heading tags, images and page content with relevant keywords. But don’t be fooled: keyword stuffing will get you nowhere. Write for users first and search engines second. With the help of social media marketing, really great content will naturally generate a strong and relevant backlink profile. Once you’ve got those three inbound marketing basics in place, you’re well on your way toward attracting leads and retaining customers. But you’re not done yet! If you really want to take your inbound marketing initiatives to the next level, you’ve got to encourage your site users to take an action—this turns them from an impression into a lead. In most cases, that action should be targeted toward getting more information from your site users. This is generally accomplished via some kind of offer. That means creating targeted calls-to-action (ie. “download this free e-book” or “enter our contest”) and building specific landing pages and forms to support these. This is where users will submit their information, ultimately building a list of contacts tailored to take the most advantage of all your future interactions. You can use this list for focused email campaigns, lead scoring, marketing automation and analytics reporting. In this way, inbound marketing becomes cyclical—making it that much easier to create the kind of targeted content that will ultimately generate more leads and help you close the sale for leads further down the funnel. Whew! The truth is, there’s a ton more to say about inbound marketing—but we hope we’ve covered the basics and given you a better idea about what you can start doing today to help grow your business. Inbound marketing is key to your online success and, like most things, the hardest part is getting started. So what are you waiting for? Do some keyword research, define a few buyer personas and start blogging, sharing and tracking today! Got questions about these inbound marketing basics or need help getting your inbound strategy off the ground? Contact Raka today.